RIT professor Roger Easton digitally recovered content from the 19th century journals kept by British explorer David Livingstone. 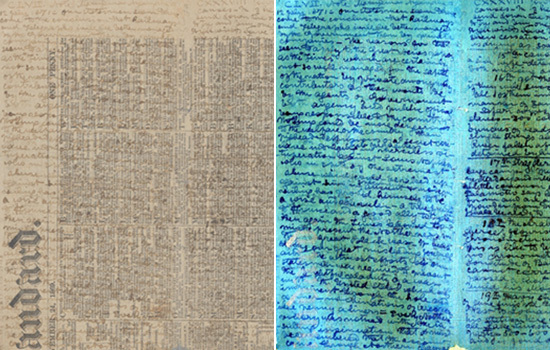 The images above show pages from Livingstone’s 1871 diary before (left) and after spectral imaging processing. Multispectral imaging technology continues to recover new insights from the field diaries of 19th-century explorer David Livingstone. A team of scholars and scientists who worked on the Livingstone Spectral Imaging project will present their research in public talks in the United Kingdom in November. While stranded in Central Africa, Livingstone composed letters, diaries, maps and sketches on scraps of paper using inks made from local berries. His writings and drawings document the Central African slave trade, social dynamics among local populations and geographical information. “Because of the poor quality of the ink, the works probably had only been read by Livingstone himself,” said Roger Easton, professor in the Chester F. Carlson Center for Imaging Science at Rochester Institute of Technology, who imaged the Livingstone documents. Easton is a member of a team of scholars and scientists, led by Adrian Wisnicki, assistant professor of English at the University of Nebraska–Lincoln, and Megan Ward, assistant professor at Oregon State University, that has assembled a digitally processed archived dedicated to the explorer. Livingstone Online: Illuminating Imperial Exploration archives more than 7,500 digital documents of original material. To make Livingstone’s writings readable, advanced spectral imaging and analysis was conducted by a team that included Easton and Keith Knox, retired scientist from the U.S. Air Force Research Labs. The team of four scholars and scientists will present the results of the David Livingstone Spectral Imaging project—including both the technical aspects of the imaging and the results of the scholarly studies—in talks at the University of Edinburgh on Nov. 14, the University of Oxford on Nov. 16 and Queen’s University in Belfast on Nov. 18. For more information, contact Roger Easton at easton@cis.rit.edu.